Have you ever wanted to play a table-top role playing game akin to Mega Man, Transformers or even Gundam? "The Robotic Age", a hopeful RPG by Preston Poland, is here to scratch that itch. For quite some time, Preston wanted to create a table top Mega Man game. 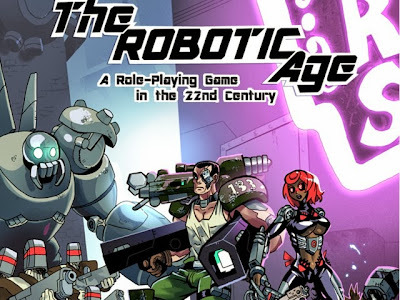 But due to the is inability to find a system that could properly run the setting, he designed his own game, "The Robotic Age", to support four different Mega Man series. What's more, Preston says his system even supports other scifi/mecha settings, like Gundam and Transformers. With Kickstarter, Preston hopes to get his game out the door. Due to copyright, there are no outright analogies to Mega Man -- The Robotic Age is unique in its own right. But for those interested in turning it into a Mega Man RPG, a stretch goal intends to reveal all the instructions you need. For more information and illustrations about this project, visit the project's Kickstarter page. This entire concept of a Mega Man inspired RPG reminds me of something I saw in Ask Capcom a few years ago with a fan asking to use the in-universe names of robot classifications for a project. Surely it can't be related though.